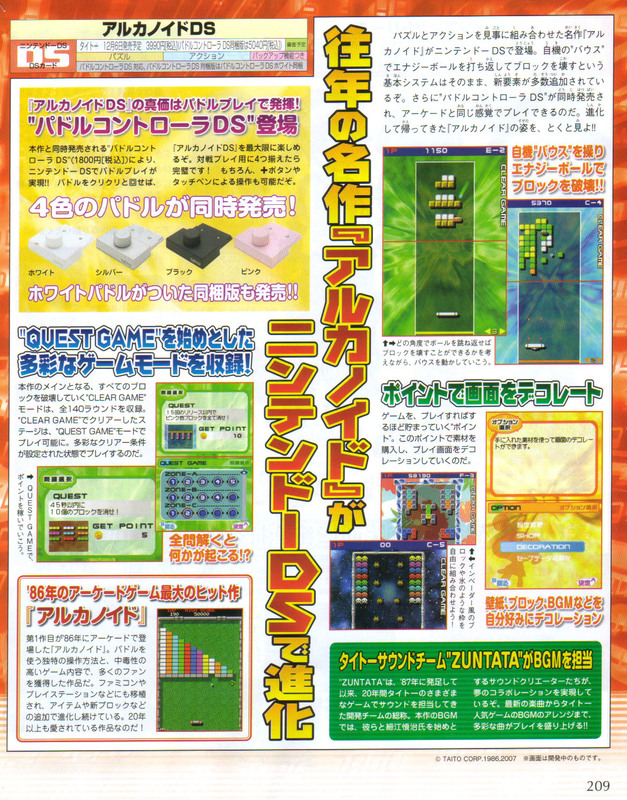 Taito, a company that I’m relay not familiar with, announced it will be releasing Arkanoid DS, according some sources. Arkanoid is a classic. and Arkanoid will be jammed with some new cool features. A “Clear Game” mode features a 140 stages. Then a Quest mode which is a puzzle mode. The game also features unlockable skins, blocks and background music. Additionally, A special controller resembling the arcade controller will be sold separately. This can be plugged onto the Game Boy Advance port of the Nintendo DS. The controller will come in white, black, silver and pink colors. Although I would like to point out that all these colors might not be available in North America, especially silver. Gonintendo has posted the following screen on their website. Their is no know date set for North America or PAL Regions, but the game is set for a December release in Japan. This entry was posted on Thursday, August 2nd, 2007 at 2:00 pm and is filed under Nintendo. You can follow any responses to this entry through the RSS 2.0 feed. You can leave a response, or trackback from your own site.